While the term dating has many meanings, the most common refers to a trial period in which two people explore whether to take the relationship further towards a more permanent relationship. “Trial Period”, you say? No wonder then “dating” didn’t take off in the land of arranged marriages! There are no trial periods – either you want to marry a girl or you don’t. Okay, I know I am being a bit harsh here. The concept of dating has indeed started in the metros in India. But for the most part, even now, a guy and a girl cannot publicly admit their liking for each other. When Anup and I were “dating”, we had to hide it from our families till we were ready to be engaged! Our families following different religions – his Christian, and mine Hindu – added to the complexity of the situation. But that’s a separate discussion for another blog post some day! I think the aversion towards casual display of affection goes way back in the Indian religious roots considering promiscuity as immoral and sinful. I have never seen my parents hold hands, and kissing in public is out of question. They don’t call each other honey or sweetie or anything that might show to someone that they are into each other. Married 41 years? Doesn’t matter. Any activities that can be considered remotely sexual in nature are restricted to the bedroom! This might sound repressive to the people who are used to the public display of affection in the western world. Heck, it’s so common here, we have an acronym for it – PDA! I have to give Anup multiple reminders about controlling his PDA when we go to India – I have had to dodge a couple of incoming kisses and it was awkward, to say the least! There is only one day when everyone gets a free pass to show off their emotions towards someone – Valentine’s Day! The boys in schools and colleges are not to miss this once in a year opportunity to express their suppressed feelings towards the girls! Bollywood movies even layout the code for Valentine’s day – white roses to ask for forgiveness, yellow for friendship, and red for love! For those of you cheering for the poor guy to be able to finally steal a kiss with the girl he has been ogling for a year, hold your horses! The display of affection is limited to flowers and some heart shaped balloons. I have been married to my Valentine for 12 years now, and balloons just wouldn’t cut it. When you give someone your heart, you want to feed them things that are good for their heart! I decided to cook something healthy that he would enjoy this Valentine’s day – a sweet potato and chocolate mousse! Sweet potato is such a versatile vegetable – I love them roasted, steamed, baked, puréed or grilled. 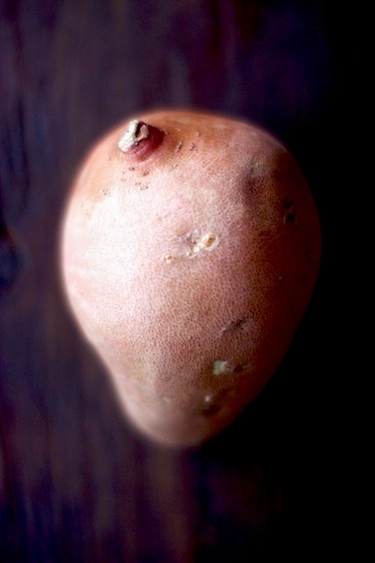 It is loaded with “good carbs” and contain almost twice as much fiber as other types of potatoes. Sweet potato is an excellent source of vitamin A, vitamin C, manganese and copper. Because of the natural sweetness in the sweet potato, I didn’t have to use sugar in mousse. I have used dates for additional sweetness. I have used raw organic cocoa powder which is an amazing health food! 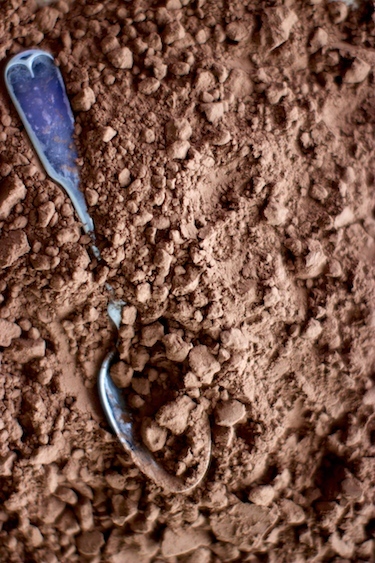 As the sugar and milk portion increases in chocolate, the health benefits of the chocolate decreases. Cocoa powder is rich in antioxidants, so you will feel great serving this dessert to that special someone! I hope you and your loved ones enjoy this mousse. Place sweet potatoes in a baking dish and bake until very soft, about 45 minutes. Let cool completely and peel the skin. Put sweet potato, cacao powder, coconut milk, dates and salt in the food processor. Blend on a high speed until it becomes a smooth mousse. You might need to adjust coconut milk according to the thickness of the mousse. Pour or pipe the mousse in severing bowls and put in the fridge to chill. 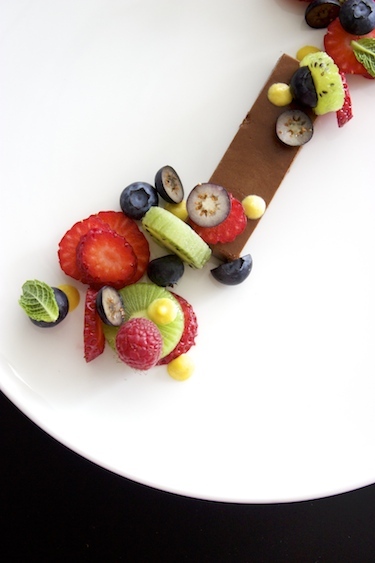 Garnish with fresh fruits and nuts, serve! Wow! Great recipe, Medha. Stunning presentation as well. 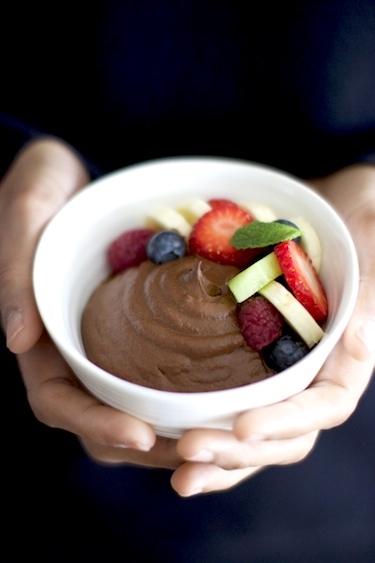 It’s crazy, I posted a Sweet Potato Chocolate Mousse recipe today as well. Our recipe differs in the slightest but it is interesting to see what you did with it. Great post! Hey Jamie, great minds think alike! Your mousse looks delicious! Wow sweet potato and chocolate.. I am just imagining how that is going to taste and sure would like to give this a try! Like the way you said about the concept of “dating in India”; but that’s the truth too! Rekha, I was apprehensive about the combination myself, but I can assure you, it’s a match made in healthy heaven! The dessert is sweet and creamy without any artificial sweetness or fats. I hope you try this recipe! Incredible dessert – I have never had or even thought of combining chocolate and sweet potato! This is BRILLIANT – your pictures are lovely! Thanks Sashi! I would amazed at how rich and creamy this dessert turned out. I hope you try making it! wow, what a healthy dessert ! sweet potato chocolate mousse looks yummy. love your creativity with food. Photos are fabulous. Cant wait to try this. Thanks Lopa, hope you try the recipe! I am sure this is right up Nikhil’s alley! Holy crap this looks amazing! I find it interesting that Valentine’s Day is so accepted when every other day of the year it sounds like such behaviour would not be. Thanks for another great story and recipe! Thanks Mallory! Even on Valentine’s Day the display of affection is limited to the PG-13 version. Lots of flowers, balloons and soft toys! it’s so interesting to hear about the aversion to casual displays of affections in Indian, you’re certainly right about the difference to the Western world! I love this recipe, the use of sweet potato in a pudding is amazing 😀 Looks delicious and fabulous for nourishing the heart this Valentine’s. Thanks Ally. I hope you try the recipe, I was surprised at how creamy and rich it tasted even without additional sugar or cream! I wish to learn plating from you someday. You are absolutely stunning at it, making art every single time! 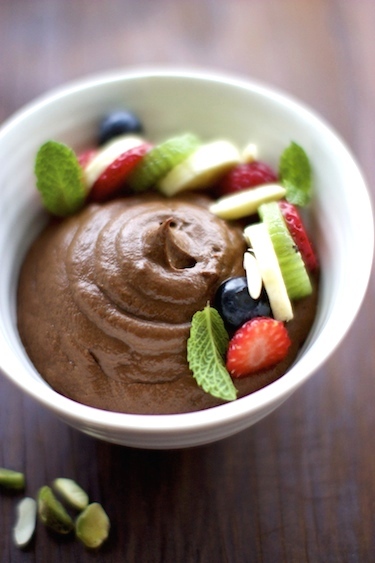 Now that mousse has to happen next in my kitchen. Looks perfect! Thanks Kankana, let me know how the mousse turns out! Supal, if you are the dessert everyday type, this is definitely for you! Hope you try it! What a fabulous recipe…so intrigued by your story as well. As a half-Indian girl, I totally struggle with so many of the same things! I get where you’re coming from. Nice to find your blog! Ameena, it’s good to know I am not the only one! Thanks for visiting! As always, loved reading your blog post. 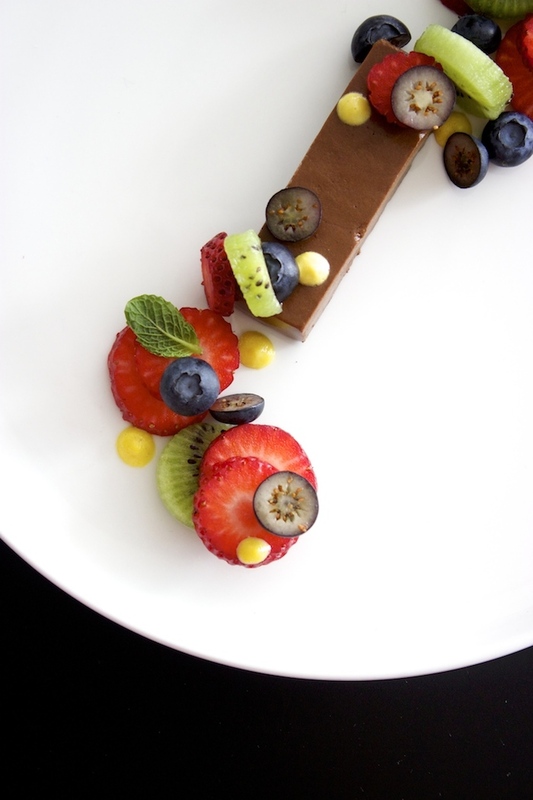 The dessert sounds perfect for the valentines and the presentation looks awesome. Sweet potato in a desert – who would have thought! Fabulous dish for your sweet! J’ose à peine imaginer le goût de cette superbe mousse. C’est certain que je vais l’essayer bientôt. Merci pour cette belle recette! I had to use Google Translate to understand your comment, and when I did, it made my day! This is absolutely brilliant! Who would have thought of making a dessert out of sweet potato…and what a lovely presentation. Thanks Sanjeeta! I have had a few people tell me they love how this recipe “hides” the veggies in it. Might be perfect for kids (and adults) who are picky eaters! I loved the little insight on “dating” in India. There’s so much variety in the world, it’s easy to forget that in some cultures affection is shown in very different ways with vastly different rules dictating how emotions can manifest. The recipe is inspired too. I love sweet potatoes and chocolate, so I think I’ll definitely have to give this recipe a try. All those natural sugars make for a nice, healthy alternative to the refined sugar laden original. Thanks for the recipe, pinning for later! 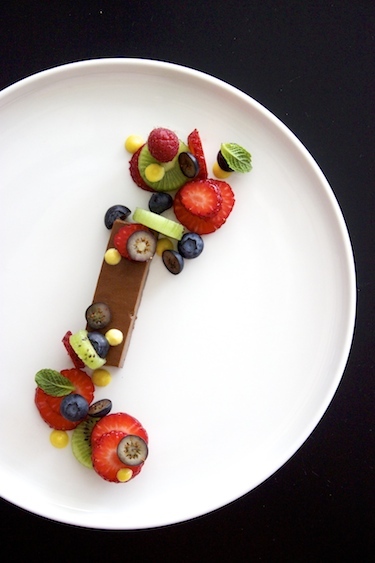 I am big fan of your deserts and plating ideas. It inspiresme to plate my day to day meals too..
One question @baking sweet potato..I dont hv oven..would it taste ok if i boil the sweet potato instead of baking? If at all the microwave can be used for baking? Thank you! You can use a microwave oven to cook sweet potato. Wash and dry them with paper towel and prick the skins with a fork/knife all over. This will allow the steam to escape while the potatoes cook. It takes about 5-10 minutes, depending on type and size of the sweet potato. Once they’re finished, let them cool to room temperature and peel them. If you boil the potatoes, then you don’t need to prick. Let them cool completely and dry before you use for the recipe. Hope this helps! Let me know how it turns out!